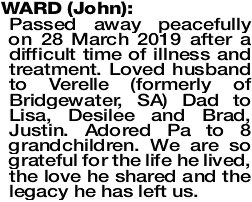 The Funeral Service for Mr John Clarence Lester Ward of Woodlands, WA will take place in the All Saints Uniting Church, 48-50 Berkeley Crescent, FLOREAT, commencing at 9.30am FRIDAY (5.4.2019). 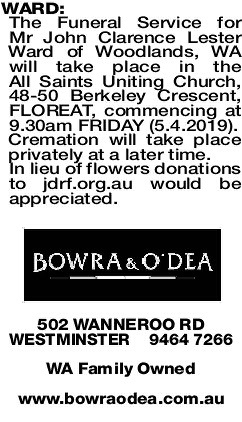 In lieu of flowers donations to jdrf.org.au would be appreciated. 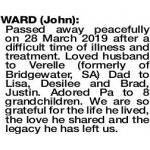 WARD JOHN Passed away peacefully on 28 March 2019 after a difficult time of illness and treatment. Loved husband to Verelle (formerly of Bridgewater, SA) Dad to Lisa, Desilee and Brad, Justin. Adored Pa to 8 grandchildren. We are so grateful for the life he lived, the love he shared and the legacy he has left us. your steadfast faith and belief in family, friendships and community will continue to guide us. You loved and were so loved. Forever with us. 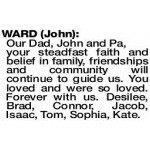 Desilee, Brad, Connor, Jacob, Isaac, Tom, Sophia, Kate. Love and prayers to Verelle and family. 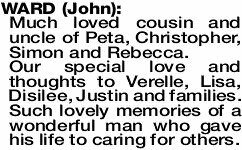 Tributes for John, a hero to the end. Always there for everyone. Will be greatly missed. Val, Brian and family. 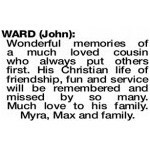 WARD JOHN Many fond memories of my dear cousin, John. Growing up together, made a special bond. Love and sympathy to Verelle, Lisa, Desilee, Justin and families. 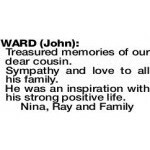 WARD JOHN Treasured memories of our dear cousin. Sympathy and love to all his family. He was an inspiration with his strong positive life. Much loved cousin and uncle of Peta, Christopher, Simon and Rebecca. Our special love and thoughts to Verelle, Lisa, Disilee, Justin and families. Such lovely memories of a wonderful man who gave his life to caring for others. Wonderful memories of a much loved cousin who always put others first. 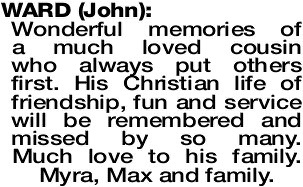 His Christian life of friendship, fun and service will be remembered and missed by so many. Much love to his family. Myra, Max and family. 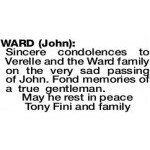 Sincere condolences to Verelle and the Ward family on the very sad passing of John. Fond memories of a true gentleman. 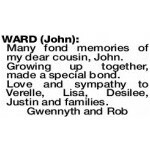 WARD JOHN Deepest Sympathy to Verelle, Lisa, Desilee, Justin and families on the passing of John. It was a privilege and pleasure to have known him and his family for so long. A life well led. RIP Wardy. 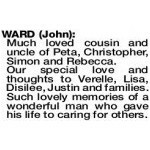 WARD JOHN Deepest sympathy to the Ward family. 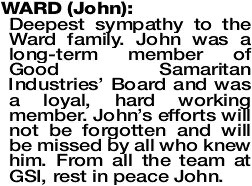 John was a long-term member of Good Samaritan Industries' Board and was a loyal, hard working member. 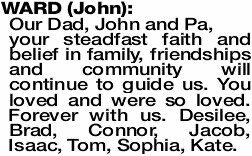 John's efforts will not be forgotten and will be missed by all who knew him. 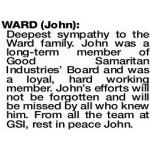 From all the team at GSI, rest in peace John. 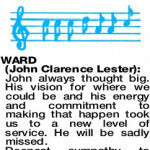 JOHN CLARENCE LESTER John always thought big. His vision for where we could be and his energy and commitment to making that happen took us to a new level of service. He will be sadly missed. 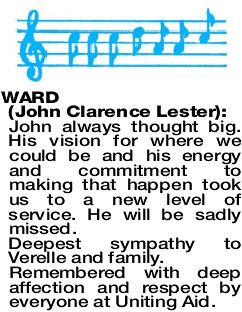 Deepest sympathy to Verelle and family. Remembered with deep affection and respect by everyone at Uniting Aid. 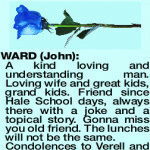 WARD JOHN A kind loving and understanding man. Loving wife and great kids, grand kids. Friend since Hale School days, always there with a joke and a topical story. Gonna miss you old friend. The lunches will not be the same. 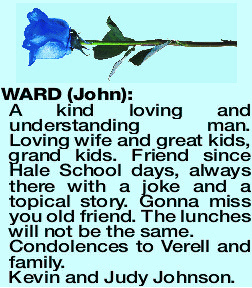 Condolences to Verell and family.